Dr. David K. Pendleton, DDS and Rockdale Smiles Center in Rockdale, TX have acquired a new technology to support patient’s needs. The diagnostic equipment is called Encompass. Produced by Pancorp, the new system is a digital panoramic/cephalometric imaging system. This allows dentists to capture the images they need to help patients while maintaining their comfort levels. With a single pass, the machine creates a two-dimensional image of the entire mouth and surrounding facial tissue. Also, the unique face-to-face design allows clinicians to quickly position patients to the appropriate position. This design not only puts patients at ease, it limits the amount of radiation that a patient will receive. It is a fast, painless diagnostic tool. Digital x-rays are also particularly helpful for children and nervous patients because the film does not have to placed inside their mouths. Who Needs Panoramic Dental X-rays? 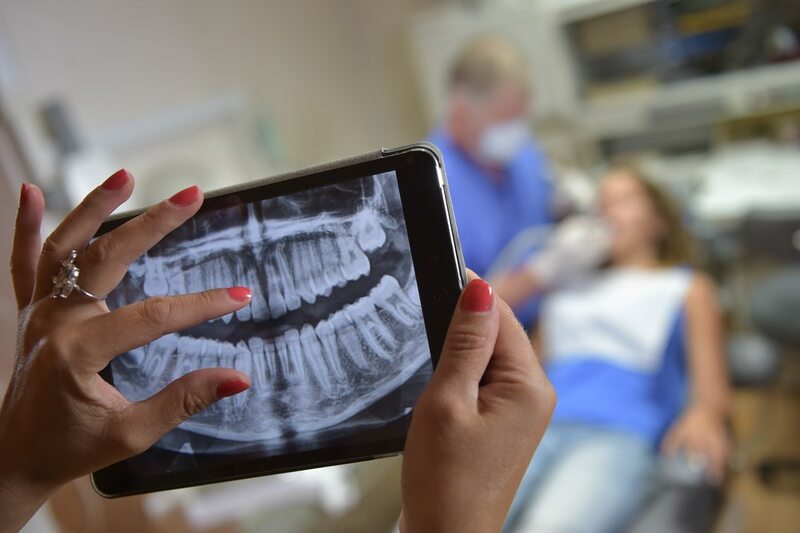 Dentists use x-rays as part of a comprehensive assessment of a patient’s overall oral health. This can help them determine areas where a patient has a current or potential issue such as cavities, cracked teeth, or failing crowns. They are also used to develop a treatment plan for procedures such as extractions, implants, or braces. Patients should expect for x-rays to be a part of an annual exam and whenever they experience a significant issue. Patients do not need to prepare for an x-ray. It is important that patients who are pregnant alert the staff so that cautionary steps can be taken. Staff will ask for glasses and jewelry to be removed. A lead apron will be draped across the body to protect from radiation. However, as the machine produces images in one pass, radiation exposure is already limited. Within seconds, clinicians will have the images that they need. There are a few differences between new digital X-rays and the traditional x-rays. Traditional x-rays capture the image on a film medium while digital x-rays capture the image and store it on a computer. This makes digital x-rays more environmentally friendly. The process also reduces the amount of radiation that the patient is exposed to. As the images are digital, it is easier for clinicians to share images with specialists if they need to refer a patient. As a Rockdale dentist, Dr. Pendleton’s inclusion of the digital panoramic x-ray machine greatly enhances patient comfort and safety. This allows his team to provide the highest in quality oral health care.